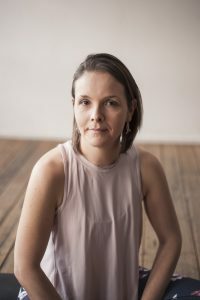 I’m Emily May and I’m a passionate and dedicated Yoga and Yoga Nidra teacher and certified Yoga Therapist. Yin Yoga is one of my greatest passions, having studied with some of the world’s leading teachers to develop my knowledge and teaching. We all have different bodies and I want to help you connect with yours to find the poses and meditation to help you get to know yourself more intimately…and to let go of what no longer serves you. I teach from the heart and with a focus on mindfulness, anatomy, meridians and energy (the chakras). Through guiding Yoga Nidras (sleep based meditations) I help students to create profound shifts and healing. It’s a true honour and privilege every time I sit at the front of a room of mindful souls to channel healing energy through the room. My yoga studies have drawn me to profoundly healing modalities and Yoga Therapy has helped me heal both myself and many others. Experiences, emotions and illness from years ago can linger in our bodies and it’s not until we face them and allow them to pass that we can free our body from being in dis-ease and enjoy a plentiful life. Hugely grateful to have discovered this practice and to be able to help others heal. I’m always eager to study, learn and advance my own practice and teaching so you’ll often discover I’m off doing a yoga training of some description either in Australia or abroad. I love translating these learnings into my classes and sharing my newfound knowledge and appreciation of the human body, yoga and meditation with my students. I’m forever the book worm reading about all things anatomy, philosophy, mindfulness and energy – I must be one of Book Depository’s most loyal customers! When I’m not doing yoga I like to travel, cook, listen to music, read and hang out with my gorgeous cat Muffin. You’ll also find me standup paddle boarding in the warmer months. I love the peace and tranquillity being out on the water with nature. It mirrors what I feel on my yoga mat.